The following table shows that the British had two ships more than the Americans, with a greater total tonnage and more sailors, although the British ships may have carried fewer men than their official complements. The total broadsides fired by the two squadrons were very similar, but the British had a significant advantage at long range. Confiance was much bigger than any other vessel on either side, so the advantage would swing towards the Americans if they could put her out of action. Source: T. Roosevelt, The Naval War of 1812. 2 vols. (New York, NY: Charles Scribner’s Sons, 1900-2), vol. Ii, pp. 117-20. The original gives the broadside of the 5 larger British gunboats as being 12 tons from long guns and 72 from short guns. This is presumably a typo, being both improbably low and the same as HMS Finch in the row above. The correct figure has been calculated from Roosevelt’s totals. Lake Champlain is long and narrow with the wind normally blowing either north or south and a northward current. Master Commandant [equivalent to a modern Commander] Thomas Macdonough, the American naval commander, anchored his ships in a line in Plattsburg Bay, which meant that the British would have to engage at short range, negating their advantage at long range. The northern end of his line was so close to Cumberland Head that the British could not turn it. A shoal prevented the British from attacking his southern flank. The order of the American line from the north was the USS Eagle, flanked by two gunboats on each side, Macdonough’s flagship the USS Saratoga, three gunboats, the USS Ticonderoga, three gunboats and finally the USS Preble. The anchors of the four largest American ships had springs attached to them, enabling them to swing in wide arcs whilst remaining anchored. The USS Saratoga, had kedge anchors off her bows, which would allow her to turn round. The positioning of the gunboats prevented the British from attacking the American line from both side, as Lord Nelson had done to the French at the Nile. Captain George Downie’s British squadron sailed at daybreak and sailed down the lake with the wind almost aft. HMS Chubb and Linnet engaged the Eagle, Downie’s flagship HMS Confiance the USS Saratoga and HMS Finch and the gunboats the rear of the American line. Downie held HMS Confiance’s fire until everything was ready, with the result that her first broadside was devastating. Half of the USS Saratoga’s crew were thrown off their feet, although many of them were not seriously hurt. However, the American ship replied and Downie was soon killed. Both ships had many guns put out of action, some by enemy fire, others because their inexperienced crews overloaded them. HMS Chubb was badly damaged by the USS Eagle and the leading American gunboats, drifted away and was captured. HMS Linnet concentrated on the USS Eagle, which was also receiving some of HMS Confiance’s fire. Damage to one of the USS Eagle’s springs meant that she could no longer fire on HMS Linnet, so she cut her other cable, sailed south and anchored in a position where she could fire on HMS Confiance. HMS Linnet then fired on the American gunboats and drove them off, before raking the USS Saratoga’s bows. Theodore Roosevelt notes that the American would now have lost the battle ‘had not Macdonough’s foresight provided the means of retrieving it.’ He ordered the anchor astern of the USS Saratoga to be let go and had her hauled round far enough to allow her undamaged port batteries to come into action. HMS Confiance had been anchored by springs on her unengaged starboard side. These could not be shot away as had those of the USS Eagle, but did not allow her to turn in order to bring her unengaged batteries into action. With over half her crew casualties, most of the guns on her engaged side out of action and her masts and sails badly damaged, she was forced to strike her colours about two hours after she opened fire. HMS Linnet could not withdraw because of the damage to her masts and sails, but kept on fighting in the hope that the British gunboats would come to her aid. They did not, and she was forced strike her colours about two and a half hours after the battle began. HMS Finch had already been crippled by the USS Ticonderoga and forced aground. The British gunboats withdrew, possibly taking a shot accidentally fired from HMS Confiance by the Americans after her capture, as a signal to do so. Roosevelt estimates that over 300 British and about 200 Americans were killed and wounded in the battle. Macdonough reported 52 killed and 58 wounded, but this excludes about 90 lightly wounded who did not have to go to hospital. The Americans took 180 dead and wounded from HMS Confiance, 50 from HMS Linnet and 40 from4 HMS Chubb and Finch. There were 55 shot holes in the USS Saratoga and 105 in HMS Confiance. Macdonough allowed the captured British officers to keep their swords because of the gallant fight that they had put up. Alfred Mahan blames Prevost for the British defeat, arguing that he should have taken Plattsburg before the naval action. The American shore batteries of the fortress could not fire on the British squadron without risking hitting the American one. However, if there had been British guns on the shore Macdonough’s position would have been untenable. He would have had to have moved his squadron further out into the lake, where the British superiority in long range gunnery ought to have proved decisive. Prevost, however, thought that a joint attack on land and water had to be made. His orders to Downie, according to Mahan, ‘used language indefensible to itself, tending to goad a sensitive man into action contrary to his better judgement.’ The land attack was called off once it became clear that the British had lost the naval action. 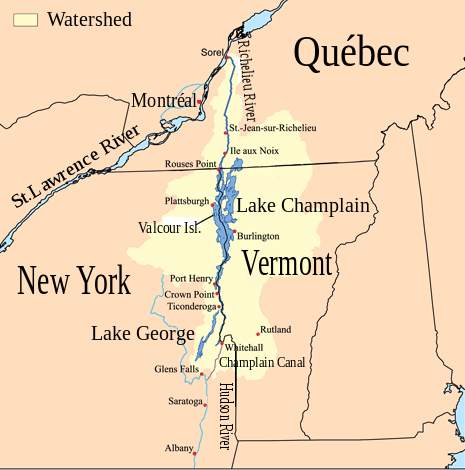 The result of the Battle of Lake Champlain was that the British invasion of the USA was halted. because it was impossible to advance on land without control of the lake. Peace negotiations had started in Ghent the month before, and the British would have been able to obtain better terms had they held a significant amount of US territory. T. Roosevelt, The Naval War of 1812, 2 vols. (New York, NY: Charles Scribner’s Sons, 1900-2). vol. ii, pp. 113-14. A. T. Mahan, Sea Power in Its Relations to the War of 1812, 2 vols. (London: Samson Low, Marston, 1905). vol. ii, p. 201.